Make a link – Link some text to an external page, or link to your character’s profile if you want. Change the size – You have an option of selecting “big” or “small”, or the default which is “normal”. Clean – If you’ve added lots of formatting to the page, highlight it all and select “clean” to remove all formatting and go back to plain and simple text. If the formatting options are causing you problems (like maybe you’re on a mobile device which doesn’t support them) you can change back to plain text by clicking the button on the right. The unlocked formatting options also allow you to add images to your post, as long as you use a separate service to upload them. A common service to upload your images is Imgur. 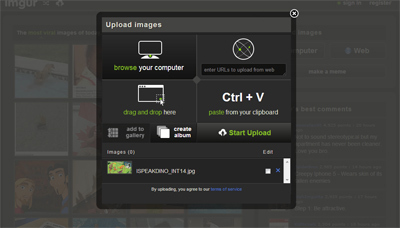 Upload your file here and you’ll get an image URL which you can add into your post by using the “Add picture” button. You’ll be asked for the picture’s URL in a popup box. Try and make sure your images are smaller than 600 pixels wide, or they might break out of the layout and make the page look untidy with horizontal scrollbars! You can use Imgur to resize the image to different sizes. Usually “Large thumbnail” will be fine.